One of the perks of being a blogger is being asked to review really great products before most of the public has their hands on them. I love being first! I love the feeling of having a part in how a product is developed and marketed. And I love sharing with all of you what I really think about a product. Recently… we were sent a couple of super cute dolls from the makers of ZhuZhu Pets. Remember those? We actually reviewed those toys when they first came out too and they were a worldwide phenomenon! My girls are pretty picky about their toys, but they ripped these open right away. The dolls are called SweetShine™ Girls. Each doll comes with a “secret shine symbol” that is revealed in the dark. The idea behind the secret shine symbol is to encourage young girls to let their inner aspirations shine through. They have cutesy little names (which my girls… ages 7 and 8… didn’t care for) but aesthetically… they are fantastic! SweetShine™ Girls are colorful, fashionable and they light up! An unexpected perk? Their heads pop off and can be swapped. Allison discovered that. 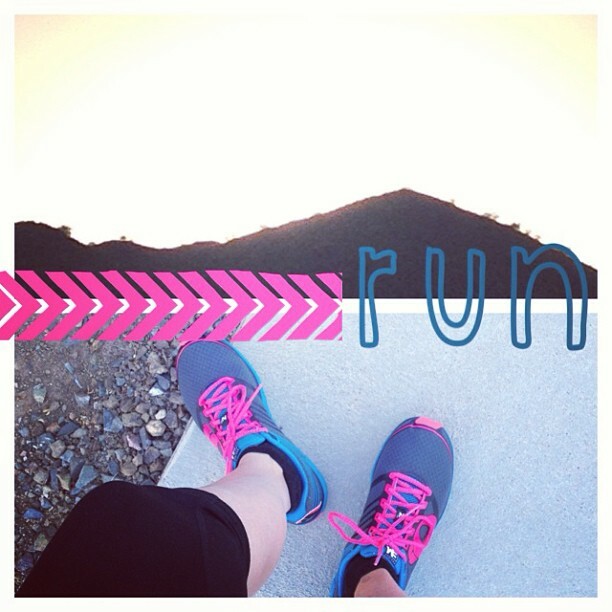 Leave it to Allison to find a way to mix and match! Anyway… immediately… we were playing with the accessories. The dolls come with a purse, shoes, bracelets, removable outfits and sparkly little hair charms that poke into their heads. They even come with a pet! So… If you have a girly girl at home that would love a combination of sparkles. 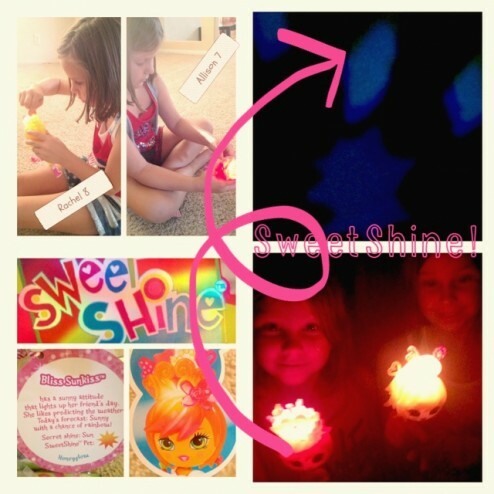 fashion and lights… SweetShine™ Girls would be a perfect gift. SweetShine™ Girls are only currently available at major retailers in the Phoenix, AZ area. But… you can WIN one here and now! Just leave me a comment on what sort of features draw your child to a toy. This contest closes on Tuesday, July 2nd 2013 at midnight pacific time. I’ll randomly choose a winner on July 3rd! Check the box to post your comment to Facebook! Today is June 25th, 2013–or as I like to think of it, the 6 year anniversary of the day that nothing happened. *Nothing. * It also happened to be the last day I endured a 49″ waist, the meal restrictions of a type 2 diabetic, and ten weeks of non-stop Kegels. That’s right you guys. 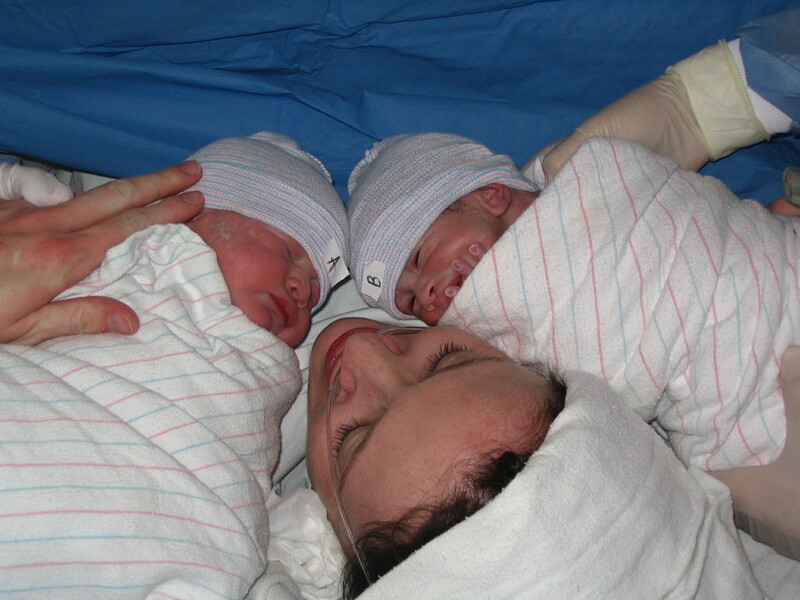 On this day six years ago, I was enjoying my last day of a high-risk twin pregnancy. 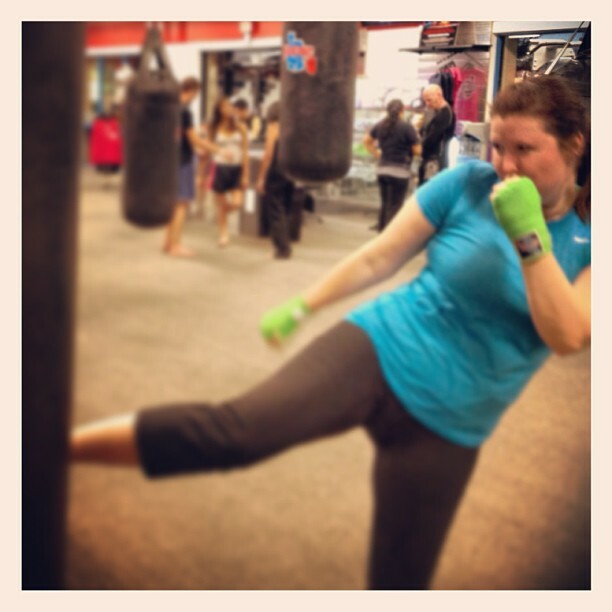 Right before I enjoyed my last sleepless night of constant back ache, twenty pounds of front-loaded discomfort and a sprinkling of hypertension. Also just before I enjoyed another weekly cervical exam the next morning. Turns out that six years ago tomorrow marks the moment when a doc declared me a glorious eight centimeters dilated and we were cleared for Go. I don’t even know what doctor told me that. Couldn’t even tell you if the doctor was male or female. All I know is that after twelve weeks of wondering if these kiddos were going to make it at all I would have done anything to expel them from my loins at this point. Twelve weeks of bed rest can make you crazy, in case you didn’t know. I was so careful and so rule-abiding for so long in terms of enduring bed rest restrictions, keeping to a maximum number of steps per day, adhering to hydration requirements, making good on twice daily Ensure consumption, being unable to drive myself anywhere, and abstaining from Twinkies after I was declared a gestational diabetic–and none of this even earned me a Girl Scout badge. Are you kidding me? And then when we made it to 34 weeks and I knew they would be fine either way, I instituted a methodical biweekly bribing strategyin an attempt to coerce my OB’s to deliver me earlier rather than later (they never gave in, those “do no harm” jerks!) and all I got was a few sad looking, pitiful expressions of “thank your lucky stars that you’re still baking these buns after everything you’ve put us through since April”? These doctors have some empathy made of steel, turning away Mont Blanc writing instruments and contraband Cuban cigars. 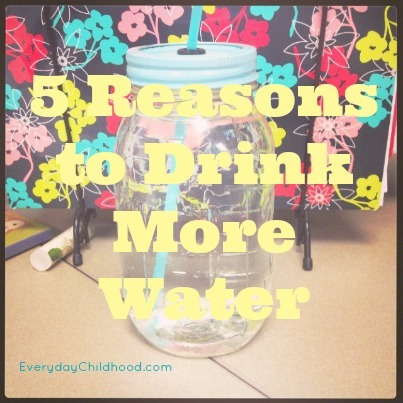 Believe me, I tried everything to evacuate my fetuses (feti?) as soon as I knew (a mother knows) they were ready for this outside world. But no, I begrudgingly gestated for two more weeks. These twins of mine are heroes. Not only did they survive an unlikely extra ten weeks like the champion embryos they were–fighting against these expelling loins of mine can only be accomplished by champions, turns out–but they were born without complications and have flourished into the delicately charming, hilarious, inspiring children who turn six years old tomorrow. Congratulations, team. We did this together. And you’re welcome for me not barfing up all that Ensure because back then I almost did a whole bunch of times that I haven’t even talked about. Hey, those extra few ounces of birth weight are pretty grateful for that fact even if you aren’t, you two. I did throw up on Baby B while in post-op, though. Have you ever been in post-op? There is precious little you can control in post-op. It’s not called Perfect Land. It’s called Post Op. Things happen. He doesn’t remember it, so maybe we should stop talking about it. Happy 6th, you crazy kids. Lately I’ve experienced an disruption in my wireless service because I’m deep inside a hospital, some government building, or a major sporting venue (coughcough, T-Mobile). Sometimes can’t even send a text, which I would think requires the least amount of connection to my wireless network and yet it still doesn’t always work. The great news is that usually these big buildings have wi-fi and advertise it. It seems bizarre that I would be able to access the entire internet from my phone before I could send a simple text, so I suppose I’d run things differently if I were in charge. Enter Whats App, a popular messaging service (It was free for the first year for me, but I see it comes with a nominal charge now) available for iPod and Android. Whats App is powered by wi-fi, so I can still send messages from my phone inside an elevator two floors beneath the main gates at Chase Field, or send updates to family from the furthest bed in the vast black hole that is our hospital’s emergency rooms. I don’t use Whats App exclusively–and when I do use it, I’m limited to messaging only my contacts who also have the app which is not necessarily all of my contacts list. Given that summer has just begun and therefore too a fresh season for attending sporting events and for kids to fall out of trees and injuring themselves, I wanted to share this gem of an app with my fellow parents. 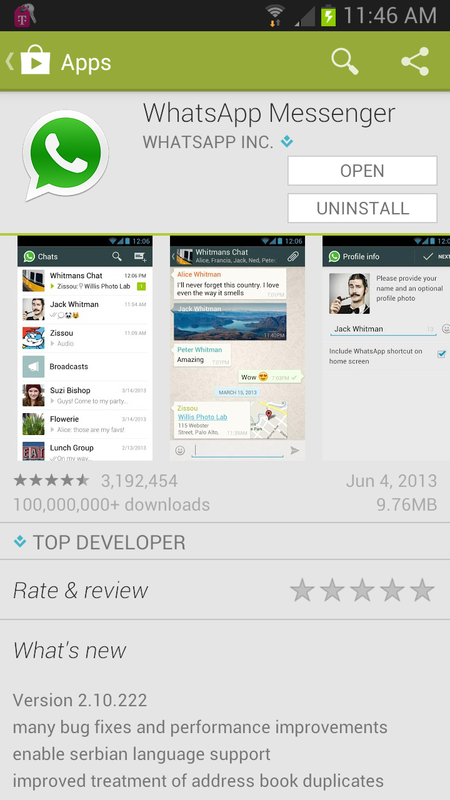 Whats App can also be used to message (to text, essentially) for free people not in my country! Sayonara, you sixty-five cent fees for goofing off with my friends in Canada! Take a gander at this 2nd grade class photo. Notice anything different? Does anything about this photo not sit well with you? If you found something remiss about this photo, you are not alone. Quite a kerfluffle is being made about this photo. For those of you who hadn’t noticed, this lovely group of children and their teacher appear to be quite physically separated from a wheelchair bound classmate. Read the full story from The Province here. When I read and saw this I was heartbroken. Nobody thought to arrange this kid with the gorgeous smile and obviously happy spirit with the rest of his classmates? Why? Was the photographer rushed? Was the teacher uncaring? How does this happen? What we’re seeing here is not right, right? 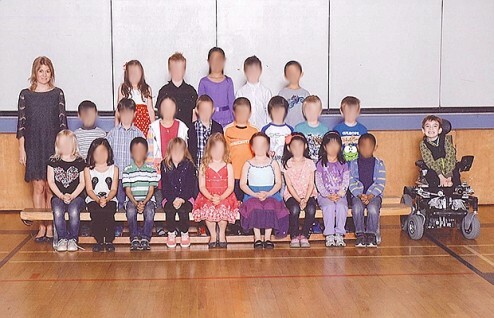 If this were your kid, would you smile and nod and stay silent about what is clearly a terribly unrepresentative photo of your child’s year in grade two, or would you be the squeaky wheel who advocates for a photo retake, a new photo which reflects your child’s inclusion with his classmates and his absolute thrill to be there with his peers? Surely you wouldn’t settle for a class photo that clearly makes your child in a wheelchair look like a segregated afterthought? And if your kid is among the happy children there on the bleachers, does the fact that their one classmate in a wheelchair sits so far away from the rest of his class sit well with you, or were you as happy to get the class photo retake as the Ambridge family was? Miles is separate, but equal. Right? Right. Except no. I’m not sure that this was a conscious decision to exclude him from his able-bodied classmates so much as it was the result of not caring enough to ensure a quality photo was taken, period. Given that I have two small children with physical disabilities who are in wheelchairs, I am obviously biased. But the technical imbalance of this photograph, at least in visual terms, surely transcends any bias I might have. From a technical standpoint this photo does not look right–like, at all. But what really stands out is the indisputable happiness on Miles’ face. He is thrilled just to be there, with some of the best mates a boy could hope for. But to echo the sentiments from the Ambridge family, Miles’ joyful grin might make this class photo even more heartbreaking than it would be otherwise. Miles is profoundly aware that he is different from his peers, but his parents (like so many of us) do everything they can to filter what he sees and hears and interprets in order to preserve his sense of self. To make sure he feels included and accepted. His parents filter so much more bias and negativity from him than he could ever notice or process on his own. Miles is only seven years old, and his parents–like every parent I know–are committed to doing whatever it takes to ensure he grows up with self confidence and with all the social skills and public education it takes to become a happy and productive citizen. It would be nice for them to be able to take a breather and let their kid have his school photo taken without having to intervene, but nope. Turns out that a class photo is a battle, too. And here’s the thing! (this is the part where you need to have read the Province article to which I linked above.) His parents would never have gone to the media or agreed to share the photo or be interviewed if the photography company (Lifetouch) would have taken the family’s initial complaint seriously and made it right. How hard would it be to look at that sweetly smiling face so far away from his classmates and immediately offer an apology and a picture retake? Just move all those other kids to the right, reposition teacher next to Miles and voila! A lovely and balanced photo awaits! But it took “coaxing” for the company to conclude that the photographer didn’t make the best creative decision and that maybe a class photo retake was in order. And everyone–the Lifetouch photography company, the school–threw the photographer under the bus over this. Don’t get me wrong, the buck stops with the photographer here–but for the school to suggest they never saw the photo until the Ambridge family brought it to their attention seems ridiculous to me. Still, Miles’ parents pushed it. They knew that Miles deserved a more adequate photo of himself and his classmates, and when their complaints went unacknowledged, they went to battle. 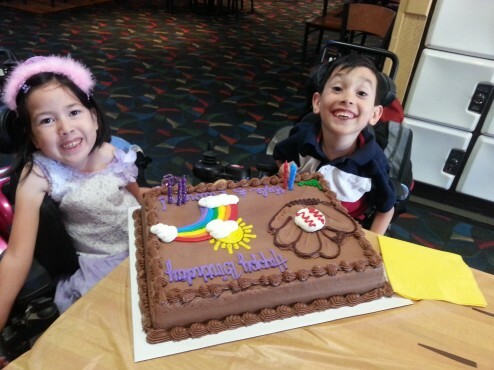 As a parent of children with a disability, I ask what is NOT a battle? Nothing, apparently. Nothing is not a battle. We become a squeaky wheel not for ourselves but for our children. Wheelchairs need an entrance to your restaurant without steps. We need a school bus with a functioning wheelchair lift. We need a ramp to access the merry-go-round. And much of the time we need written permission in advance before we can access these things. “Can’t” is not in our vocabulary and we will NOT allow our kiddos to be made to feel as if they do not belong with their peers. In my opinion, that is as much a disservice to their peers as it is to them. Diversity, people. Compassion, you guys. I’ve read the reader comments on the Province article. Some are supportive, but many are depressing to me. But we parents of disabled children–or parents and friends and family of disabled children and adults–we are not unreasonable people. We simply advocate for those we love who cannot advocate for themselves. And in the cases of our disabled children, we advocate for them in part as role models so that they may witness our efforts, learn strategies, watch our persistence, sense our patience, and know that it all comes from our passion and love for them and that they deserve it. And that goes for all our children, able bodied or not. And let me assure you–there is nothing we would rather do than NOT have to be that squeaky wheel. It’s just that sometimes we have to put on our big girl/boy pants and keep the world steady for our kid. The naysayers can’t stop us from making sure our kids have the most fulfilling life possible for as long as we have them. We parents have thick skin. Slight us all you want. The bad news for you is that the kid drives an electric wheelchair–get in his way and that’s 350 pounds of whimsical karma grinding down on your toes as he passes you by.